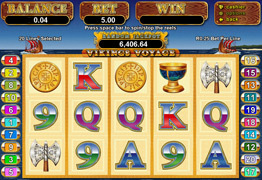 Slot Games listed are Vikings Voyage Slot, Victory Slot and Victorious Slot from Net Entertainment. A rather wild looking Viking is a substitute symbol and his Longboat is a scatter symbol in this 5 Reel and 20 Payline slot. The left to right OR right to left payout style of this game is really nifty and helps keep the player interested in the game. 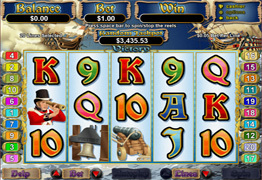 Two or more Longboats get you 10 free games and you can win respins during the free games. Set sail on the seven seas with the HMS Victory, an RTG slot game. There is lots of treasure to be found on these reels and you could get up to 50 free games when 3 or more flags appear. Wins are doubled during this feature and if you’re lucky enough to have a ship present, your wins will be multiplied by 4! 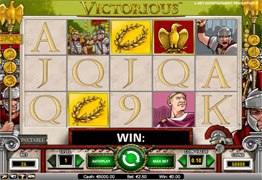 Victorious is a Roman inspired 5-reel slot game from Net Entertainment featuring a massive 243 ways to win. The Golden Eagle carried by the Roman troops acts as a wild and if you get 3 of these, it will trigger the free spins feature where you can get up to 25 free spins at 3x multiplier.